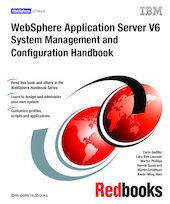 This IBM Redbooks publication provides system administrators, developers, and architects with the knowledge to configure a WebSphere Application Server V6 runtime environment, to package and deploy Web applications, and to perform ongoing management of the WebSphere environment. One in a series of handbooks, the entire series is designed to give you in-depth information about the entire range of WebSphere Application Server products. In this book, we provide a detailed exploration of the WebSphere Application Server V6 runtime environments and administration process.